Importer Thierry Thiese's "most exciting young producer in Champagne"
Chartogne-Taillet is a Grower Producer in the village of Merfy, about 10 kilometers northwest of the center of Reims. Most people, wine nerds included, haven't heard of Merfy because, as their US importer Michael Skurnik puts it, the terroir "while good is not aristocratic." The Chalk based soil is covered by a layer of about 60cm sand and clay which is not ideal. Alexandre Chartogne describes it as the wine roots being forced to "live in two environments." They do a phenomenal job with what they have, and make up for lack of an exceptional terroir with great winemaking. Kind of like I'm an average looking guy but I only date supermodels and babysitters (OK, I exaggerate somewhat, and perhaps some people exaggerate somewhat about Chartogne-Taillet. I have not drank enough of their wines, nor dated enough super models nor babysitters, to form a solid opinion yet). Chartogne-Taillet has 1.5 hectares, 40% Chardonnay, 38% Pinot Noir, 20% Pinor Meunier, 2% Arbanne. Occasionally he legally supplements with up to 5% Chardonnay from Avize. Each parcel is vinified separately, both in stainless steel and more and more commonly in neutral barrels: concrete egg shaped vessels. Vinification in Eggs in much different and you can read far more at Thierry Thiese's Champagne Report (pdf). Alexandre Chartogne, in charge of the cellars, has worked with the famed Anselm Selosse of Jacques Selosse and applies many of his concepts. No pesticides are employed at all, sometimes two black sheep are used to eat the weeds between the vines, plowing is done by horse which compacts the soil less than a tractor, and Alexandre is experimenting with biodynamic techniques which is no surprise as he worked with Selosse. Interestingly, all of their wines except Cuvee St. Anne come from a single vintage, whether vintage dated or not (French wine law has some very specific and seemingly complicated requirements for a wine to be a Vintage Wine above and beyond the grapes being from a single harvest). Le Rose NV - A Rose which is 60% Pinot Noir and 40% Chardonnay. 15% still Pinot Noir from 50 year old wines added. Tasting note below. “Les Orizeaux” Extra-Brut Vintage - A Blanc de Noirs, all Pinot Noir. “Les Barres” Extra-Brut Vintage - A Blancs de noirs from 100% ungrafted old vines Pinot Meunier. “Cuvée Fiacre” Brut Millésime - This is their tête-de-cuvée or best wine, with 60% Pinot Noir and 40% Chardonnay. Millésime Brut - Their basic vintage wine with 60% Pinot Noir and 40% Chardonnay like the like the “Cuvée Fiacre” above. 100% Pinot Noir from the single parcel "Orizeaux" in Merfy. Rated A- for its festiveness and exuberance among other characteristics described below. Definitely an outstanding wine. A festive medium yellow color. The nose has delicate apples, small whitish/pinkish flowers - a lovely floral tone, and chalk. The palate is full bodied yet delicate with great balance and excellent acidity. Minerals, lemons, some apple, a light touch of orange. 2008 vintage (although not officially a "Vintage" wine). Disgorged 07/2013. 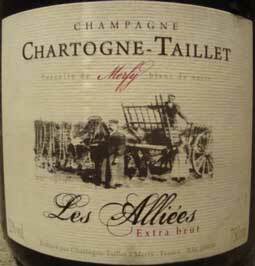 Tasting Note: Chartogne-Taillet Les Alliees Extra Brut - October 2014, B/B+ - lovely, but honestly a glass or two of anything 100% Pinot Meunier is enough for me. Slightly less expensive than the “Les Barres” which is also 100% Pinot Meunier. 100% Pinot Meunier from the lieu-dit ‘Les Alliees.’ This is a single parcel on the west side of Merfy that was planted in 1969. The ground is black sand above chalk bedrock. 2008 Vintage, although not officially a vintage wine. 07/2013 disgorgement. A very exuberant wine! Rich apple flavor. On the nose, minerals, light red fruits, apple, and apple peel. 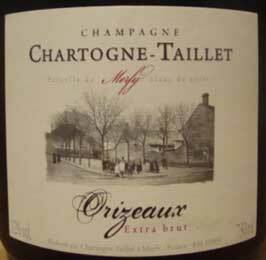 The palate is luscious and rich, festive and fun, but not aristocratic (which I never find in 100% Meunier). Fresh apple. Slight minty-ness on the tailend with air. 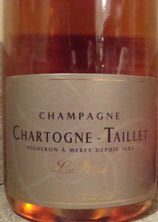 Tasting Note: Chartogne-Taillet Le Rose NV - January 2013 - rated B/B- and a fun wine for sure. I must note that most seem to rate this wine much higher than I do, but I like it! Disgorged 9, 2011., All 2007 grapes. Copper with a pinkish hue. The nose is pleasantly meaty with lots of minerals. Chalk. On the palate this is fun and easy drinking with a fun racy quality. A tad of pomegranate. Touch of rose water and orange.